It's a lustre, so it's quite sheer but still very pigmented and moist looking. 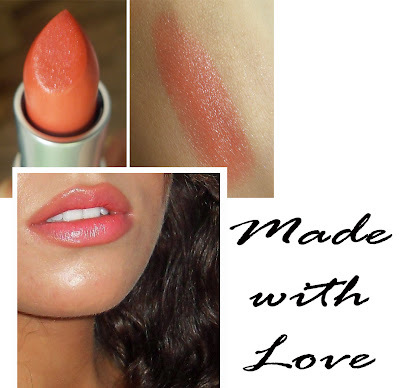 This is the perfect coral colour for the summer, teamed with a tan and lots of bronzer, this will look "the bomb"! I'm quite scared of brights normally, but this is very wearable unlike my shocking Nars Red Square. This is definitely going to be my summer staple. I will be rocking this on holiday, if I go! Cheeks: Barry M bronzer, Nars Albatroos and Mac Gold Deposit msf. Eyes: Mac Natural flare quad - the lightest gold all over lid and brow bone, darkest brown in crease and upper lash line. Mac Zoomlash mascara. UD Lucky 24/7 pencil on waterline. Lips: Mac Made with love, BeneFit "Posh" lipliner. What's your summer staple lip shade and what do you team it with? I love it!! Im so glad I picked it up.. at first i thought the texture was a bit funny but i exfoliated and then moisturized my lips and it looked much better! Muhsine, you look lovely as ever! Your hair looks wonderful. During summer I mainly stick to lip balms and conditioners during the day as my lips tend to get dry. Right now I use either the body shop lip butter or my hello kitty lip conditioner. However in the evening I like to stick to pinks and corals, pretty please and way to love are firm fave's! That color looks so pretty on you! I don't think I can pull off bright colors well. I do have MAC "Morange" which is like one of the brightest colors.. lol and "Vegas Volt".. the only way I can wear them is if I apply it to my lips, pat it off with a tissue and apply clear gloss. One of my summertime colors is "Sandy B" its a pinkish coral frost. Ooo, this has got to be one of my favorite pictures of you, if not THE favorite one! You look absolutely radiant and the color of the lipstick compliments your skin so much! I want it! :) Love the highlight on your cheekbones!! Albatross? @michelle yay, thanks, albatross - im loving it! such a pretty glow! Ooooh that is so pretty on you..now I must get it! I am rocking the Ultra Elegant slimshine and Lychee Luxe lipglass from MAC..not together of course..but those are my summer staples! Hands down my fave lippie on you! :) This is my favourite type of lip colour ever!!! :) I love it on you hon! Aww wow you look so angelic and lovely. It seems to be one of those 'my lips but better' moment. All lip colors look great on you! You look gorgeous in it! It's a really nice shade on you. it suits you perfectly!! gorgeous! Gorgeous as always! I just picked this up myself. It reminds me a bit of MAC See Sheer which is also a very pretty coral. i love your olive skintone...wish i could wear bronzers and gold like you...your make up is great! You look amazing in coral - ur hubby made a great choice! Ps. The lighter hair + the conical waver is a great summer hair combo - I really like it!! It looks great up against your dewey skin! You look fabulous! I am so, so terrible at wearing makeup, but I like to look at people who are fabulous at it in the hopes I get better. I usually just wear lip gloss- the best I can do! Albatross looks amazing on your cheeks!